THE CHIEF: Bill Skelly is set to become the new Chief Constable of Lincolnshire Police next year, succeeding Neil Rhodes who is due to retire next month. The next Chief Constable of Lincolnshire Police has a 255-mile trip from the south-west coast of England ahead of him before taking up his new post. Bill Skelly (50), a married dad-of-two who was born in eastern Scotland, emerged from a pool of five candidates to take pole position in the race to succeed Neil Rhodes as head of policing in Lincolnshire. Mr Skelly was selected after a worldwide search for the county’s next Chief Constable which was open to applicants from Australia, Canada, New Zealand and the United States of America. Speaking after an exhaustive interview process which took place last Thursday, Mr Skelly said: “I am honoured to have been chosen for the task of serving the Lincolnshire community. “It is a beautiful county and I have been impressed by the many passionate and dedicated people I have met so far. Lincolnshire Police and Crime Commissioner, Coun Marc Jones. Photo by John Aron. EMN-161209-162233001. The appointment of Mr Skelly is expected to be confirmed at a meeting of Lincolnshire Police and Crime Panel members on Monday, December 19, in what is the most important decision to be taken by Police and Crime Commissioner, Coun Marc Jones. He said: “Bill Skelly impressed us with his strategic views, having run policing operations as Deputy Chief Constable of Devon and Cornwall Police. “Coming from what are largely rural counties, Bill very much understands rural, countryside and coastal communities, all of which are the kind of challenges we face. “Bill also has some understanding of the funding challenges we face and he came across as being very thoughtful, very knowledgeable and very able. Mr Skelly’s career as a police officer began when he joined the former Lothian and Borders Police, now part of Police Scotland, in 1990. He completed a Diploma in Applied Criminology at Cambridge University and worked with the Scottish Government and Edinburgh University to improve crime prevention in eastern Scotland. In 2005, Mr Skelly was seconded to the Metropolitan Police, based at New Scotland Yard, London, where he led an Immigration Crime Team whose main priority was breaking up gangs involved in the trafficking of women for sexual exploitation. A year later, Mr Skelly was back at Lothian and Borders Police where his policing skills were used in areas such as alcohol licensing, public protection, ports policing and prevention of chemical, biological, radiological and nuclear attacks. Coun Jones said: “The process of appointing Bill to be Chief Constable of Lincolnshire Police was one where I wanted the involvement of representatives from businesses, charities and community leaders. 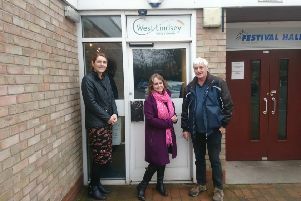 “Bill and the other three candidates who were interviewed first met with this group which brought together people from different aspects of the Lincolnshire community. “Then there was a separate interview panel, made up of myself, the Police and Crime Commissioners for North Yorkshire and Northamptonshire, an independent senior executive from the College of Policing and a local council chief executive. “Having met all of the council executives in Lincolnshire, I specifically wanted Anna Graves (chief executive of South Holland District Council) because I was very impressed by her attitude and forward-thinking. Coun Jones said that Mr Skelly, a former HM (Her Majesty’s) Inspector of Constabulary for Scotland in 2008, was chosen from a “very small, but very good field of candidates”. Mr Skelly’s imminent appointment as Lincolnshire Police’s new Chief Constable is the latest step on a career ladder which also included a crucial role at the 2014 Glasgow Commonwealth Games. Mr Skelly was in charge of safety and security for the event, a role which he described as “fascinating and hugely challenging work”. But in December 2013, seven months before the Commonwealth Games opened in Glasgow, Mr Skelly was appointed Deputy Chief Constable of Devon and Cornwall Police. Speaking about the role of policing in April this year, Mr Skelly said: “Crime accounts for only part of the work we do as a force.